The tech research firm Gartner made headlines in late 2012 when it predicted that 80% of current gamified applications would fail to meet business objectives — due to poor design, ineffective communication, or ill-defined business objectives. 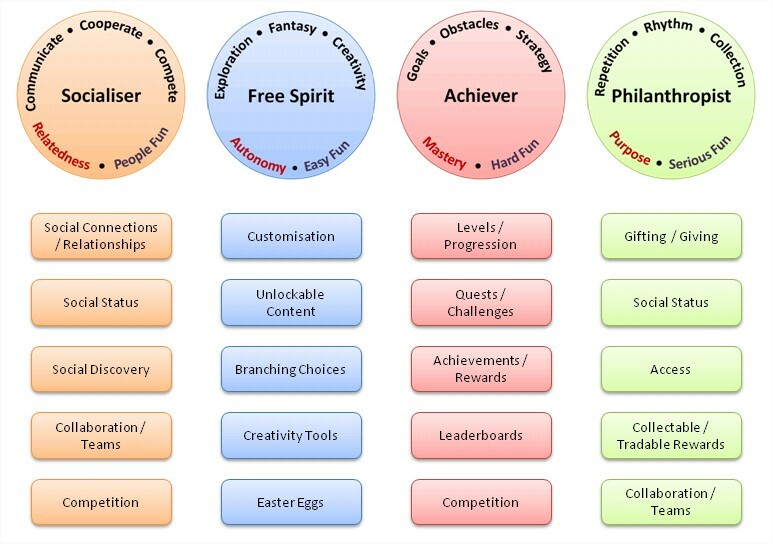 If poor design is a primary culprit of failed gamification, how can you improve your chances of success? Free Spirits are motivated by Autonomy. They want to create and explore. Philanthropists are motivated by Purpose. This group are altruistic, wanting to give back to other people and enrich the lives of others in some way. Players are motivated by Rewards. They will do what is needed of them to collect rewards from a system. Disruptors are motivated by various things, but in general they want to disrupt your system, either by directly or through other users.